As the owner of photographs, you can download original files back to your computer at any time. You can even download all of the images in a gallery in one action. 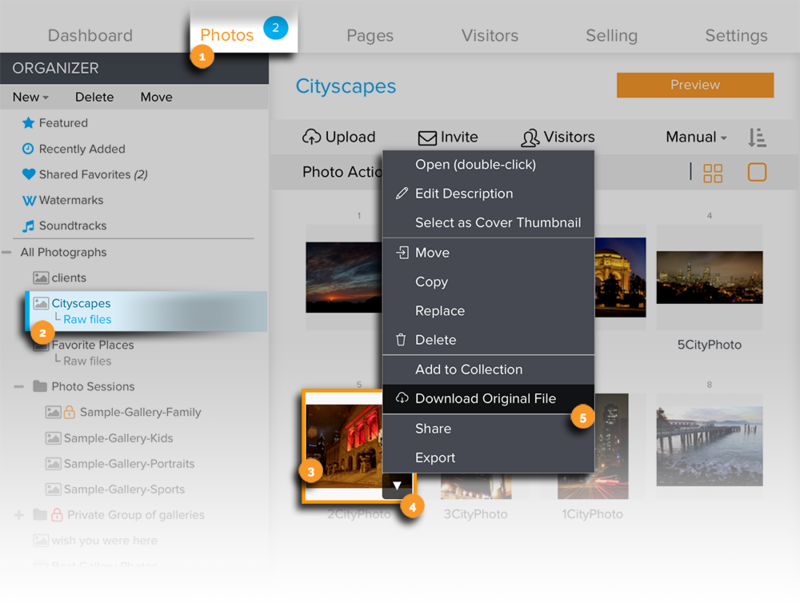 Here are all of the different ways to download copies of original images from your account. While it is noted that these steps can be used to download photos, they can also be used to download videos from the account. 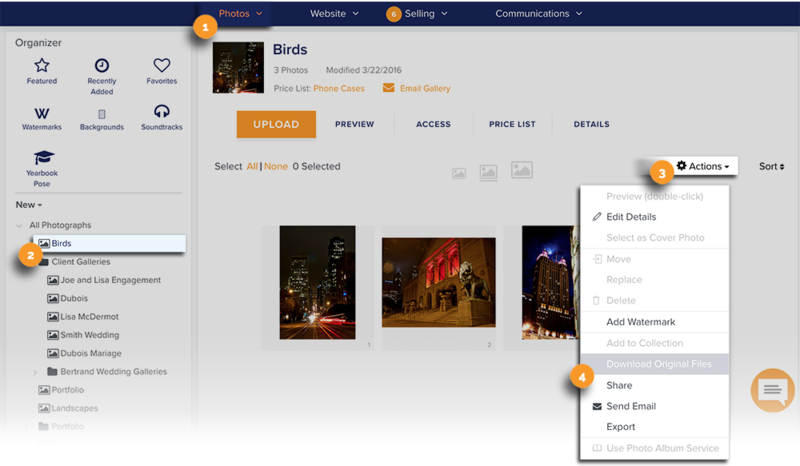 For Zenfolio users that signed up after May 10 2018, please click here for updated instructions using the new Photos Page in the Dashboard. Unfortunately, there are no option provided that allow all photos from the account to be downloaded in one action. The images can only be download from one gallery at a time. 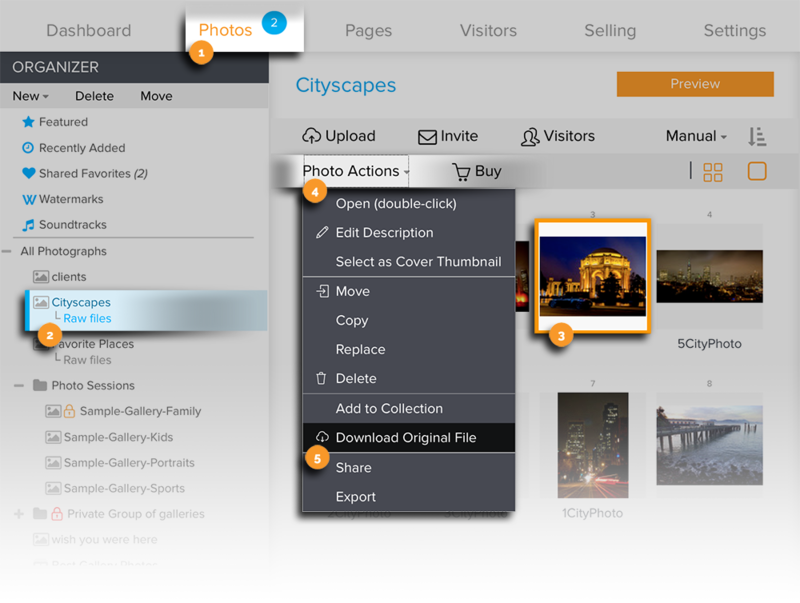 All of the images in a gallery can be downloaded in one action through the Dashboard. In the Dashboard, go to Photos. Navigate to the gallery that contains that photo(s) that you would like to download. Under the Toolbox column, click on the ⓘ icon. The gallery's Information panel will be displayed. Click Download all photos or click Download all photos & linked raw files to download all photos and any files in RAW storage that are linked to the images. All of the images in a gallery can also be downloaded in one action through the new Photos Page. Click on Actions. The Actions menu will appear. In the menu, click on Download Original Files. 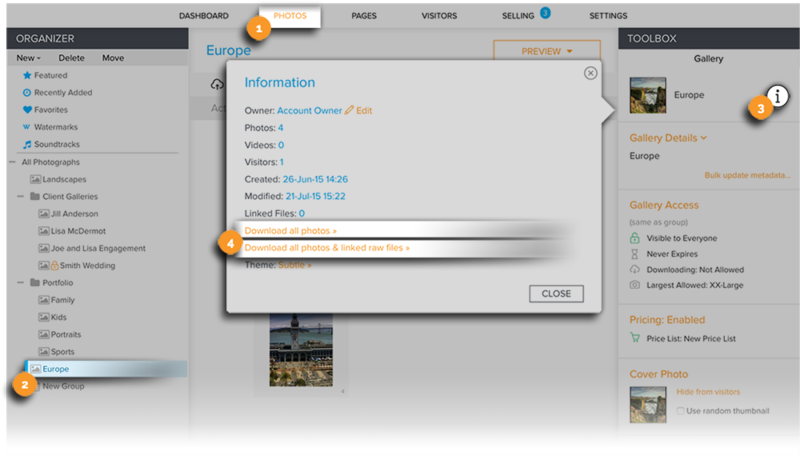 The steps below show how individual images can be downloaded by the photographer. Select the thumbnail of the photograph you would like to download. Click on Photo Actions in the toolbar above the images. The Photo Actions drop down menu will appear. From the Photo Actions Menu select Download Original File. A system popup window will open with a confirmation for downloading the file to your computer. Note: You can download multiple photos by holding down the Control key on your keyboard (Command key on a Mac) while selecting thumbnails or using the Select All link at the bottom of the page. The photos will be downloaded to a zip file on your computer. Click on the down-pointing arrow that appears. A drop down menu will appear. In the drop down menu, select Download Original File. A system popup window will open with a confirmation for downloading the file to your computer. Select the thumbnail of the photograph you would like to download. The thumbnail will become highlighted and details for that photo will load in the Toolbox. Click on the ⓘ icon in the Toolbox to load Information about the image. Click Download original photo in the Information panel that appears. A system popup window will open with a confirmation for downloading the file to your computer. You may also allow visitors to download original files to their computer. This is convenient if you want them to be able to print the photograph on a personal printer or at a local photofinishing lab. Please see this guide on how to allow your site visitors to download copies of originally uploaded images. When downloading multiple images at once, the images will be bundled altogether into one zip file. Once downloaded, the zip file will need to be decompressed or unzipped before the images can be viewed or shared. Click here for how to decompress or unzip a zip file.